We received an email from a dear reader asking about where the best tiramisu is~! Thank you for asking - because we can proudly say that Bistecca (restaurant) in Yongsan-gu has the most authentic tiramisu I've had in the city. Yes, it's an Italian restaurant. YES, they DO have the best tiramisu in Seoul! By far, the most authentic, down to earth, simple tasting tiramisu in Seoul. No frills and pretty looking toppings - just the best ingredients. You can taste it. It is what tiramisu should be (even better than the recipe from what I learned from Le Cordon Bleu). the waiter serves it right off a big plate of tiramisu - scooped out to your plate! They sell their tiramisu by the plate (small, medium, large). Prices running from 10,000won for small, 35,000won for medium and 45,000won for the large plate. You can actually get 5000won back if you return the plate! Worth the taxi ride or walk up the hill just for the tiramisu alone (they do have great Italian food if you're hungry). But so worth it just for the tiramisu. If there is available seating - grab one and hull a plate of tiramisu to go and get a cup of coffee. 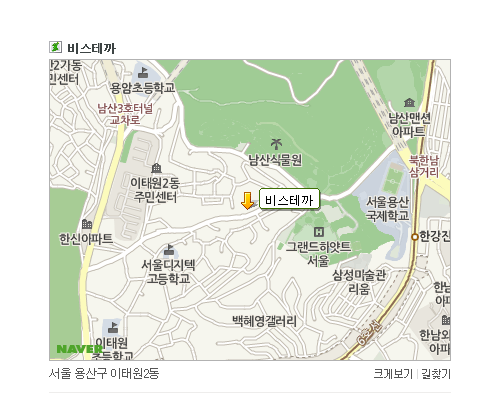 런치 LUNCH: 12:00 - 15:00 디너 DINNER: 18:00 - 22:00 ***Reservation is recommended for dining - you can call in and speak in English! By taxi: Give the taxi driver the address and easy and swift go! By subway: Get off "noksapyung" station(one stop away from Itaewon station) - exit 2 - keep walking down until you see an underground passage - walk underground and get up to the stairs to your left. Walk out of the underground passage and once you see the road turning to the right, keep walking that street. It is a long uphill walk - about 8 mins or more. As soon as you're at the middle of the uphill street - keep an eye out to your left where the restaurant is, Bistecca.